One thing I have noticed over the years, is that we all have this sort of funky relationship with the word “hero.” It probably came up for you the second you read the word hero on this post. You may think it’s narcissistic. Egotistical. Self-promotional. You may even think that it’s something to be bestowed on you rather than self-acclamation. Yes, yes, and yes. But as we look at the crisis, complexity, and confusion in our world today, I believe there are leaders out there attempting to get the job done and it is simply not happening. We need to take leadership to a whole new level. If, as John Maxwell says—leadership is influence, we might need something beyond leadership. The Hero. Now all of you had a hero pop into your head. Might be your dad, Superman, Henry Ford, let’s stay there for a minute…and ask, how are they different? I would offer this: Heroes LEAD us not to a place but to a different kind of destination… to a better, truer self. Heroes offer an act of love in an uncertain world… I know- there is another awkward word- love. We are not comfortable talking about love. I get that. I’m in the military and we don’t DO love. We kill people and break things. Agápe (ἀγάπη agápē[) is love in a “spiritual” sense. Éros (ἔρως érōs[) is “physical” passionate love. Philia (φιλία philía) is “mental” love. Storge (στοργή storgē) is “affection” in ancient and modern Greek. So, I am not talking about the warm, fuzzy, romantic love here. This is phila— a dispassionate virtuous love. It is a concept developed by Aristotle, and includes loyalty to friends, family, and community which requires virtue, equality, and familiarity. In ancient texts, philos denoted a general type of love used for love between family, between friends, a desire or enjoyment of an activity, as well as between lovers. The hero is a greater good leader devoted to things well beyond himself. 2) Outstanding Achievements— These Heroic achievements are engaged in voluntarily, conducted in service to one or more people or the community as a whole, involve a risk to physical comfort, social stature, or quality of life, and are initiated without the expectation of material gain. 3) Noble Qualities or High Moral Character— Heroic leaders must display integrity, fortitude, honesty, loyalty, along with love, joy, peace, patience, kindness, goodness, faithfulness, gentleness and self-control. 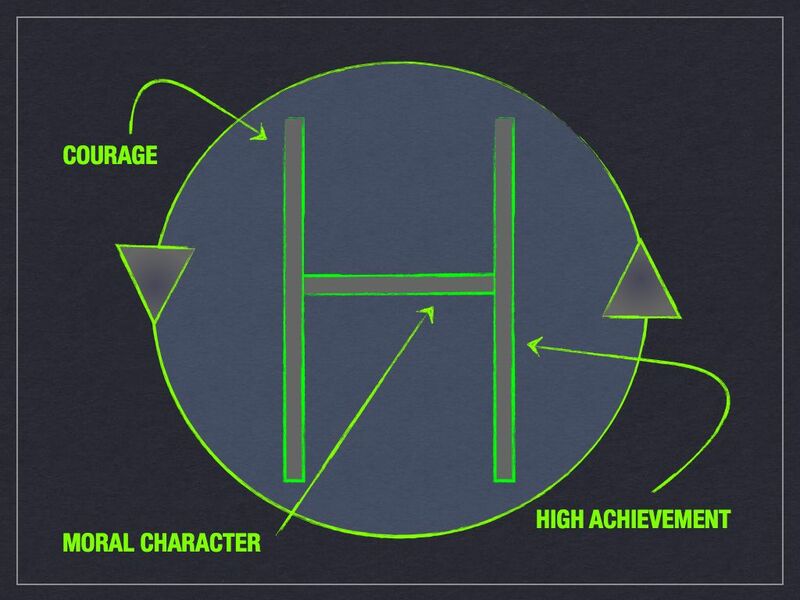 Visualize a capital letter H. The first vertical line is courage, and the second is outstanding achievements (creditability), but they are only two lines if they are not bonded by the horizontal line of high moral character. A couple of thoughts regarding Heroes. 1: A Hero does not think of himself before acting. 2: A Hero only considers the consequences of not acting at all. 3: A Hero will not accept nor expect any rewards. A true Hero will not wait around for thanks. 4: A Hero acts on instinct. There is no thought behind a heroic deed. 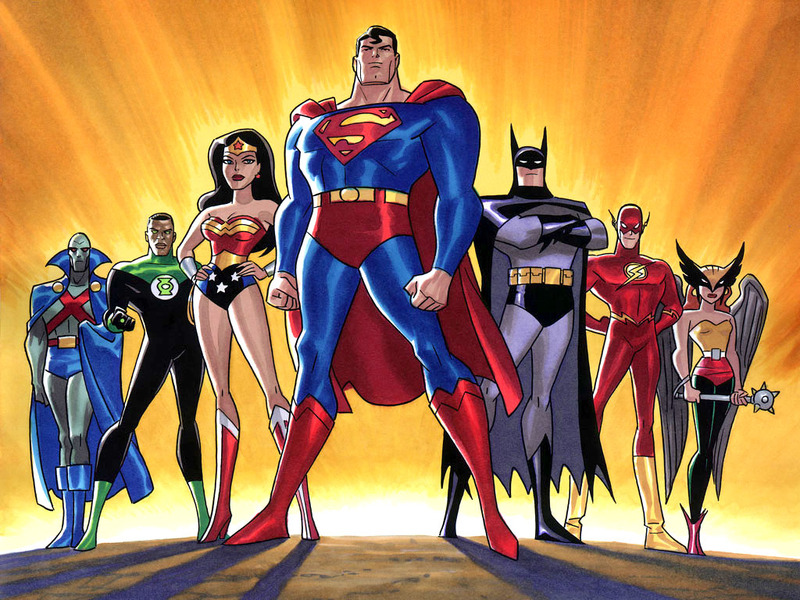 The hero movement is not the same as random acts of kindness. Heroism is very distinct. A hero is not someone you simply admire or respect. A hero is a courageous person with creditability and powerful moral character– a greater good leader. Don’t be a bystander or a minion. If someone is being bullied or hazed at school or at work — be a hero. If someone has had too much to drink and they are about to drive– be a hero. If someone is being sexually “hit on” and has not given consent– be a hero. As Maxwell points out, leadership is influence, but a hero uses his leadership and influence out of a love and bond to his brothers and sisters and their advancement in the greater good of themselves and the organization. So, obviously we need to start a Hero Movement. Movements are nothing new. Some movements have been evolutionary, while others have been revolutionary. It’s not too difficult to make the case that leadership has devolved rather than evolved. I am sure we all pay close attention to the media and world events. 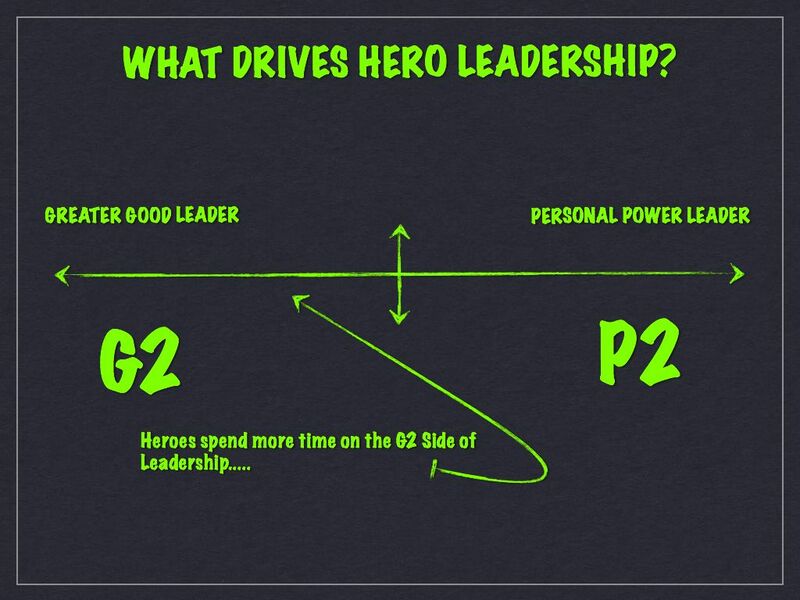 It would appear those serving as personal power leaders greatly outnumber those serving as greater good leaders today. So the point of the entire post? I am simply encouraging all of us to start making personal and professional changes. Please challenge what is considered “normal” or status quo in terms of leadership with the goal of shattering outdated thinking. We must dialog and debate, but most of all, we must listen, learn, and act; and we have to take leadership to a whole new level. We simply need more heroes. The Hero Movement…. 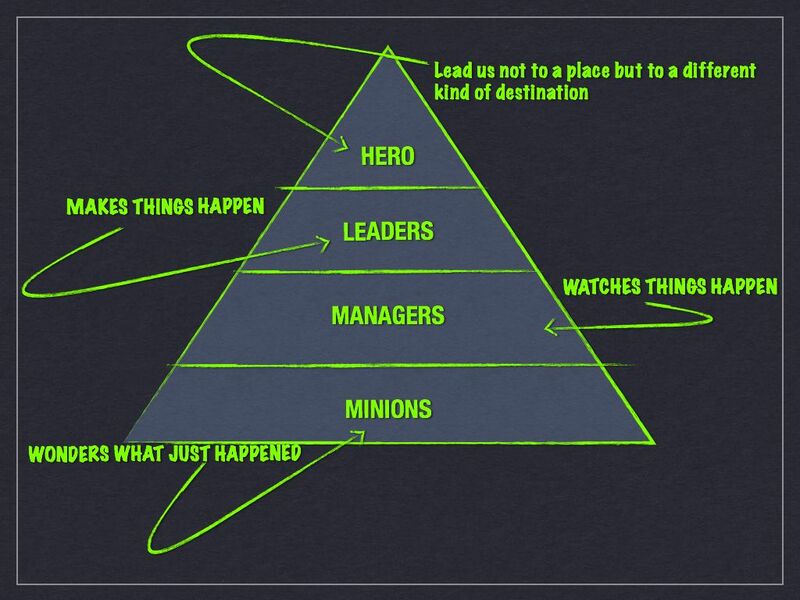 Be a hero, because advancing leadership will change the world. Great post sir! I really needed this today. It is good to know that there are real leaders out there who not only lead others for the greater good but teach and bring up new true leaders. Keep it up!